Optim™ Performance Manager Extended Edition, a follow-on to DB2® Performance Expert, is one of the key products of the IBM® Optim Solution. Optim Performance Manager Extended Edition provides a comprehensive, proactive performance management approach. It helps organizations resolve emergent database problems before they impact the business. 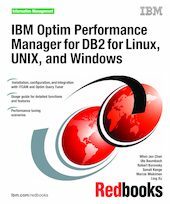 This IBM Redbooks® publication describes the architecture and components of Optim Performance Manager Extended Edition. We provide information for planning the deployment of Optim Performance Manager and detail steps for successful installation, activation, and configuration of Optim Performance Manager and the Extended Insight client. Optim Performance Manager delivers a new paradigm in terms of how it is used to monitor and manage database and database application performance issues. We describe individual product dashboards and reports and discuss, with various scenarios, how they can be used to identify, diagnose, prevent, and solve database performance problems.